Manila, Philippines - The October 2017 Licensure Examination for Certified Public Accountant (CPA) results are released by the Professional Regulation Commission (PRC) Board of Accountancy (BoA) on November 2, 2017 or ten (10) working days after the last day of board examinations. A total of 4,511 out of 14,816 examinees (30.45%) passed the CPA licensure exams held on October 7-8 & 14-15, 2017 at designated testing centers nationwide. Complete list of passers arranged in alphabetical order, topnotchers as well as the full results and PRC important reminders are itemized at below summary. Licensure Examination for CPAs are held twice a year for aspiring Certified Public Accountants. For October 2017, a total of 30.45% overall passing rate was recorded. 4.68% lower than the most recent CPA exams (May 2017) having 35.13% overall passing rate. Shown below is the statistical table of examinees for CPAs in the last four (4) years. Alfonso Solomon Ramos Magno from University of Santo Tomas ranked first in the CPA exams garnering 91.33% rating followed by Judy Ann Malate Tuzon from University of the East - Manila having 91.17%. Meanwhile, University of the Philippines (UP) Diliman ranked first in the list of top performing schools having all of its 69 examinees passed or 100% passing rate followed by De La Salle University - Manila having 101 out of 109 examinees passed or 92.66% overall passing rate. 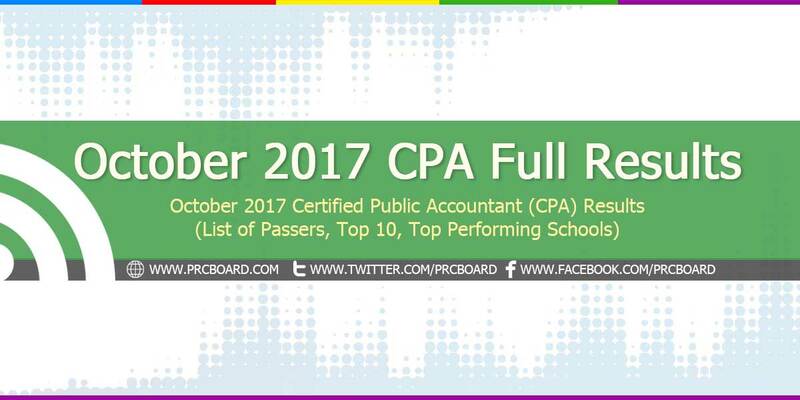 To receive real-time updates on October 2017 CPA Board exam or any updates on board examinations conducted by Philippine-based agencies such as PRC, NAPOLCOM, CSC, among others, we advised to visit their respective official websites or follow us at our social media accounts via Facebook and Twitter. Congratulations to all CPA BOARD PASSERS especially to my grandson JASPER BRENT YAO YOUNG.